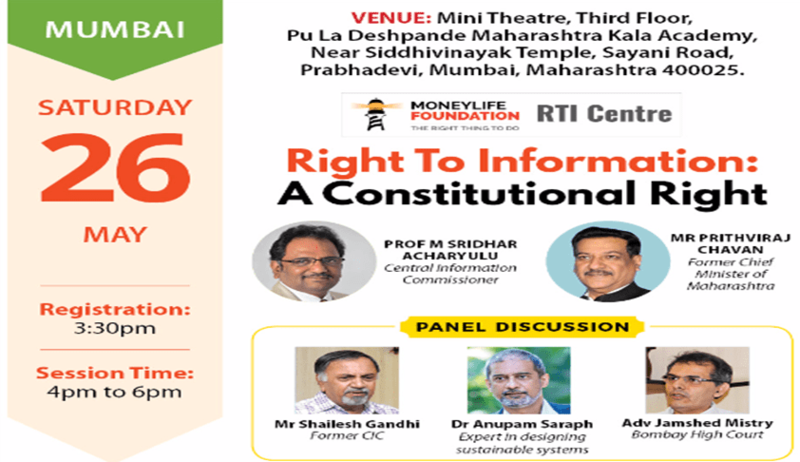 Moneylife Foundation is organizing a panel discussion on ‘Right to Information: A Constitutional Right’, with Prof M Sridhar Acharyulu, Central Information Commissioner, as the Speaker. Guest of Honour: Prithviraj Chavan, former Chief Minister of Maharashtra. Venue: Mini-theatre, 3rd Floor, Pu La Deshpande Maharashtra Kala Academy, near Siddhivinayak temple, Sayani road, Prabhadevi, Mumbai, 400025. Entry is free but registration is mandatory. To register, click here. Alternatively, you can also register 022-49205000, or foundation@moneylife.in, or +91-7045156415. Queries can be addressed to Shilpa Raut (+91-7045156415), or Shrikrishna Kachave (+91- 8796655413).